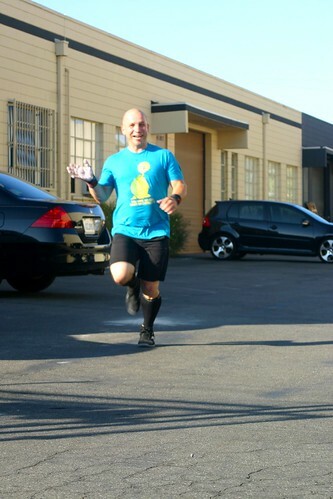 Home » WOD Blog » Going the distance. Having a plan for a workout is essential for me. Not that the plan needs to be executed perfectly (in most cases it’s not), but the skill required to “game” a task does take some experience. For today’s 20 minute amrap (and for just about any wod) it’s about knowing what you’re capable of with each movement and doing what you need to do to keep moving for a good amount of time. Can you hold on for all 200 meters? What’s the most sustainable rep scheme for the dips (7-3, 5-5, unbroken for as long as possible?) It’s worth mentioning that there are a few people out there that don’t pace, game, or plan anything. They have two speeds, on and off, and while I secretly covet that “balls-out-go-as hard-as-you-can-all-the-time” ability, I’m also older and wiser and know that for me it’s not sustainable nor will it give me the desired outcome (more work in less time, remember?). It’s up to you to set the pace today. It’s not going to be fast, but it’s not something you should sandbag. Don’t freak out when you look at the clock and it shows only 6 minutes have gone by…..breathe, relax, and do what it takes to keep moving. By the end you will have accomplished way more than you thought.